Our online courses let you study almost anywhere, on your time. Virtual classes allow you to be online at the same time as your professors and student peers, giving you the opportunity to collaborate in a dynamic virtual space. The College of St. Scholastica's learning options are nearly limitless. Take a look at the online programs we offer. 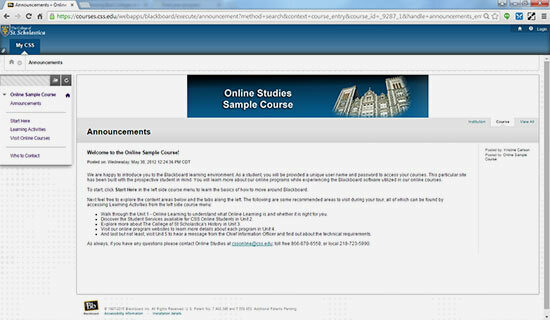 Our online courses are a lot like our on-campus ones - dynamic. They're filled with learning tools, multi-media presentations and discussion boards that help make learning an interactive, collaborative experience. All you need to do is meet a few simple technology requirements and you’re ready to begin. Our synchronous virtual classrooms allow students to join faculty and other students from multiple locations through our full-feature video and audio conferencing. Recording capabilities, breakout groups, whiteboards, polls and chat rooms help students with group work and presentations, and make this an engaging learning experience. Think this technology is too complicated? Don't worry. We offer in-room support for students and faculty 24/7/365. Note: Zoom is available for a select set of courses. Please check with your admissions counselor or advisor for availability. Your own personal advisor will help you define an individual course plan to reach your goals, and will provide you with ongoing support to ensure your success. You’ll learn in small classes, with plenty of individual attention from your professors and interaction with other students. Whether it’s through counseling, tutoring, advising or in student community groups, you’ll have access to the same services and activities as our on-campus students.